I’ve covered a lot of hot dogs on this list. Chicago Dogs. Pink’s Hot Dogs in LA. Coney Island dogs. Rochester White Hots. And even the hot dog’s cousin, the Half Smoke. You’d think I’d be running out of hot dog varieties, but, really, I’m only barely scratching the surface (God bless the fine folks at Wikipedia for gems like this). Which brings me to the latest variety, the “New York System” hot dog, native to Rhode Island (and not, as the name would suggest, New York… but then again, you won’t find a Coney Island hot dog anywhere near Coney Island, NY, either. Sometimes, you just gotta roll with it). For those that have never heard of the style, New York System Wieners (or, in a regional mispelling, several places use the mispelling “Weiner”, such as today’s entry) are similar to a “Coney Island” or a “Michigan” hot dog. It starts with a slightly smaller veal and pork sausage than your normal hot dog, served in a steamed bun with meat sauce (sweeter and milder than Coney Island sauce, and definitely way too mild to be called a “chili”), mustard, onions, celery salt. The last of these is what makes the style unique, since while celery salt is a standard Chicago Dog topping, it’s not often seen on a Coney Island dog. 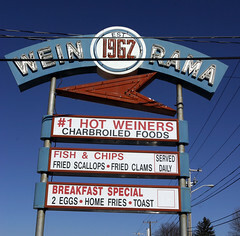 In any case, there are several “Hot Wiener” joints in Rhode Island, including Olneyville New York System, Saugy’s, and today’s entry, Cranston’s Wein-O-Rama. Wein-O-Rama is your classic 1960s-vintage diner, with a service counter and a row of booths around the central food service area, featuring the large grill upon which they cook the “Hot Weiners”. They also have your standard diner fare, such as burgers, fries, onion rings, etc. But the real action here is their namesake, so I placed what’s a pretty standard order in RI: two hot weiners, fries, and a coffee milk. I was pleasantly pleased with my weiners. The hot dogs were pretty basic, but the meat sauce was flavorful and spicy, without being overly hot. I’d like to know exactly what spices they use, but that sort of thing is a pretty closely kept secret in the New York System world. While it would be odd on most Coney Island dogs, the celery salt works well with the slightly sweeter meat sauce of the hot weiner. The fries were similarly good, nice and crispy, and the coffee milk was the perfect beverage to pair this with. All-in-all, a very good lunch for $6. 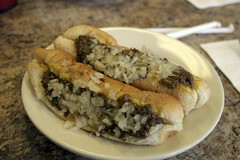 If you get a chance, Worcester, Mass., has two great hot dog spots. Hot Dog Annie’s and Coney Island Hot Dogs. Hot Dog Annie’s, the finest, IMHO. Wow… great name for a place. I grew up down the street from this place, but I haven't been in years! As any of us that travel frequently can attest, the average quality of airport food is particularly lousy. Usually it’s either fast food (served up by HMS Host catering, or some other similar foreign equivalent), captive-audience priced, or served by people that don’t seem to understand that airports are frequented by people that are often in a hurry. So usually the result is quickly wolfing down some overpriced crappy food, hoping that your next flight won’t be plagued by food poisoning.